It is crucial to emphasize that these changes depicted on this site may or may not be due to human activities and climate change. Search website by using CTR+F and type in your search term in the box. Images include changes related to climate change directly (e.g. glaciers melting) and indirectly (e.g. pine bark beetle infestations), as well as consequences of energy development/use (e.g. Chernobyl 2011 and damming the Nile for hydroelectricity). It must be emphasized that images of global change are not always due to or attributable to human induced climate change. For example, images of Caspian Sea from week of June 30, 2011 show changes that are due to human activities, specifically irrigation diversions of streams into the Caspian Sea for growing cotton. While this is not directly related to climate change, these changes did impact human health and alter weather patterns in the region. New images are added periodically. Comments from expert scientist: The striking visual imagery effectively communicates earth surface changes. The changes themselves are compelling. Imagery from different instruments and missions is being (at least visually) set to a similar reflectance scale, in order to allow for visual comparisons. 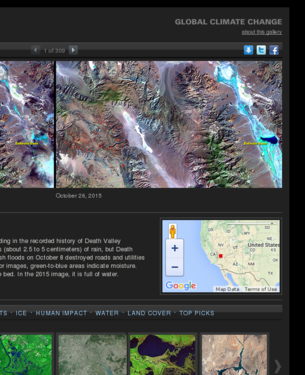 These images show dramatic, large-scale changes over relatively short time scales. It is important for viewers not to jump to conclusions about the cause or attribution of the change. Students could explore the collection and find images, processes, or locations that are most compelling to them. Background materials or readings are not provided. Users can scroll through the images one at a time, or they can select images from a grid of thumbnails, or sort them by topic or location.